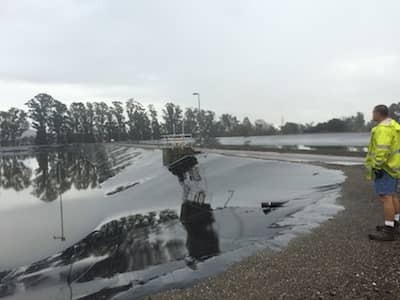 Geomembrane liners are often used in impoundments to prevent the migration of wastes out of the impoundment to the adjacent subsurface soil, groundwater or surface water. 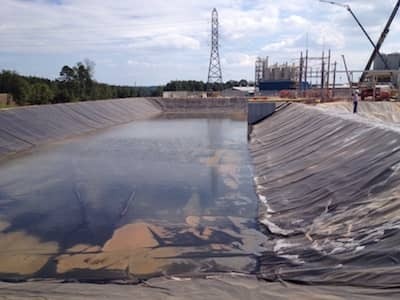 Impoundment liners are used significantly in the energy industry to contain fresh water and wastewater, drilling waste, evaporation pits, and coal ash. Geomembrane liners used in these types of applications are made from a wide range of polymeric materials and different types of constructions, so how do you choose the right one for your exact application? In order to prevent contamination of the surrounding environment, careful consideration must be given to determine the best high-performance geomembrane liner that meets the precise requirements of the impoundment. In order to determine which geomembrane is best suited for your application, a detailed analysis of the effluent should be performed by an analytical laboratory. In some cases, a Safety Data Sheet (SDS) that lists the chemicals being contained and their respective concentrations may suffice. The results of the analysis and/or SDS information must then be provided to the geomembrane manufacturer for approval. Other factors, such as length of service, operating temperatures, the foundation, and fluctuations in service should also be provided. Additionally, other effluents that may be introduced to this liner in the future should also be considered and reported to the manufacturer. Some geomembranes, such as XR-5® reinforced geomembranes by Seaman Corporation, have had proven performance in a wide array of impoundment liner applications. These membranes are reinforced, specially formulated to resist a wide range of effluents, can be prefabricated or fabricated on-site, and have a reputable history of long-term performance.